At Microsoft, we’ve made a strong commitment to the U.S. Public Sector by delivering a complete Government Cloud solution that includes Azure Government, Office 365 Government, and CRM Online Government. 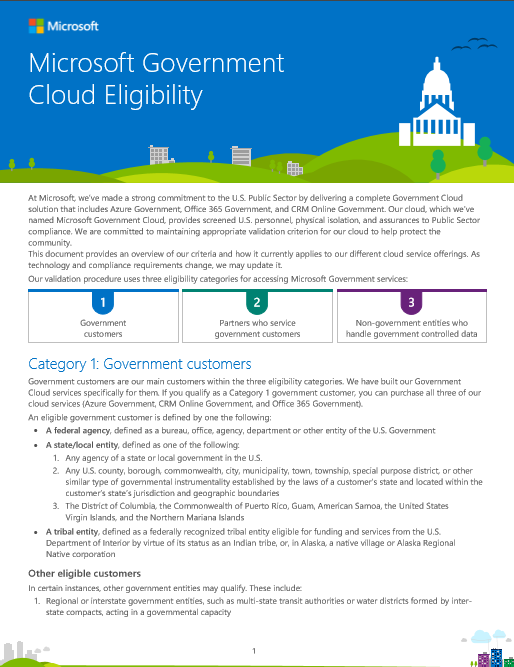 Our cloud, which we’ve named Microsoft Government Cloud, provides screened U.S. personnel, physical isolation, and assurances to Public Sector compliance. We are committed to maintaining appropriate validation criterion for our cloud to help protect the community. This document provides an overview of our criteria and how it currently applies to our different cloud service offerings. As technology and compliance requirements change, we may update it.